The Château de Raissac is located near Beziers, on the border of the Orb river, between plain and hills. It was built on a Roman villa and has played an important role in the region’s history thanks to its location and its owners. In the year 2000, a major Neolithic graveyard was discovered in its vineyards, archeological proof that people lived and worked on this land 6000 years ago. It was during the XIXth century, a prosperous period when wine provided wealth to many families in the region, that the Château de Raissac became the imposing neo-classical building we see today. 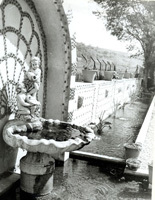 Jean and his wife Christine Viennet, the sixth generation of owners, have lovingly restored the domain. Jean Viennet is also an artist. Christine Viennet, an internationally renowned ceramicist, has founded an important Museum of ceramics in the beautiful old stables of the Château where art and wine go hand in hand. Today, their son Gustave Viennet and his wife Marie take care of this large domain of vineyards. The wines are exported internationally (Asia, Eastern country, Europe, Russia, USA…). They welcome you warmly in their guest rooms. An old Roman villa, villa Raixacum was discovered in the year 2000 with an important Roman wine-cellar in our vineyard named the Crès. irst written trace of the Château : ''Raixacum'', ''Rixac'', ''Reissacum'' et ''Reissac'', as well as of the Domaine of Puech-Cocut (''Podini Cocutum'', ''Garden of Puech-Coucut'', ''Garden of Pied-Coucut''). The Seigneury is attached to the Dumas family, an important land owner in the Béziers area. The Seigneury enters by succession into the Barrès family. Joseph-Barthélémy Viennet, nephew of Jean Pons Guillaume Viennet, buys the Château. The two domains of Raissac and Puech-Cocut are brought together by a marriage. Its owner, Louis Viennet (1813-1881), was elected member of the National Assembly. He was an MP till 1875. Reconstruction of the Château de Raissac by the architect Michel-Louis Garros. The Château has remained the property of the Viennet family, passed on from one generation to the next.